Bespoke’s Stock Seasonality Tool is an easy way to quickly find the seasonal tendencies for US equity indices, ETFs, and individual stocks. The tool is available to you if you’re a Bespoke Premium or Bespoke Institutional member. We monitor the tool on a daily basis for periods of the calendar year that stand out as bullish or bearish. When we checked the tool today, we noticed that the upcoming weeks and months have been quite bullish for the US stock market in recent years. As shown in the screenshot below that we took from the tool this morning, the S&P 500 has seen a median gain of 1.07% over the next week when looking at the past ten years worth of trading data. Based on our gauge that compares the upcoming one-week period to all other one-week periods throughout the calendar year, this is typically a “good” week for the stock market. Over the next month (February 4th through March 4th), the S&P 500 has seen a median gain of 2.26%, which is also a “good” period for the market relative to all other one-month periods on the calendar. 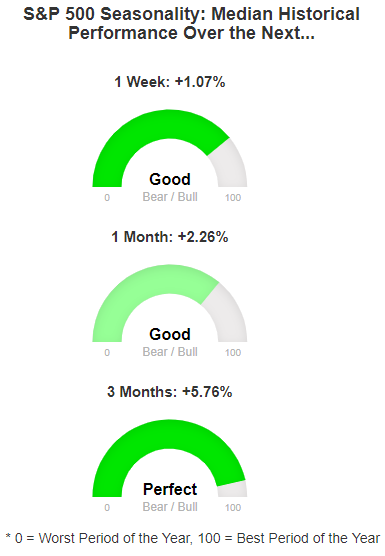 Finally, the upcoming three-month period (February 4th through May 4th) has been an exceptional period for the stock market over the last ten years. Our gauge measures the next three months as “Perfect” relative to all other three-month periods on the calendar. Going back to 2009, the S&P has seen a median gain of 5.76% over the next three months.